Christopher Bollyn from American Free Press has released a new article (and has another about to be posted) continuing the feud that has erupted from the same popular mechanics magazine mentioned before..
Reopen911.org and Loose Change DVDs ready to go! Big day in terms of 9/11 related videos..
i came across this app today, and man is it cool.. basically it shows you a company, and its board of directors.. then from that board of directors you can see what other companies a person is a member of..
anyways, check it out.. it is really insightful in understanding how closely tied some corporations are.. be sure to use the 'load' function to load the most popular connections, such as how the energy companies relate, and a bunch of others..
Are we really searching for bin laden? does it look like goss thinks we are actively searching for bin laden? it doesnt to me.. to me it looks like he thinks what bush is saying is a joke, and completely removed from the truth..
so, if we arent really searching for bin laden, why not? perhaps they know something they would rather the public not know, like we dont really want to find him, or we already have, or he is dead, etc..
i have just relocated my personal blog to this new address, 911blog.blogspot.com.. i have been blogging about 9/11 for about 5 months on my personal website.. i decided to move all of my 9/11 comments to a new site, one devoted to just 9/11 and apart from my other website..
leave some comments, ask some questions, and welcome! i beleive the edited version only has the commercials cut out..
i stayed up last night from midnight til 4am to listen to the head researcher of the recent popular mechanics article be interviewed by art bell on 'coast to coast'..
after 3 1/2 hours of going over the article, and talking down about anyone and everyone, there was 30 minutes of actual discussion.. i was blown away by the incredibly biased conversation that i sat through.. they received a call at the begining by Lisa Guliani, she asked a great question, but art said chertoff wasnt on the line yet, and never brought her question up to chertoff..
of the few callers who did get in, a few asked decent questions, or made decent comments.. and to those chertoff said they hadnt researched it.. it was quite apparent that asside from the 16 points in the article (that they spent 3 1/2 hours going over), they had little to no knowledge of anything else, including the 6-8 highjackers who are still alive.. they had never heard of that, and doubted its credibility, showing they really dont know much in the great scope of 9/11 oddities. ust got hit with some links (thanks phil) that are pretty interesting.. art bell, whom i think most ppl have heard of, is having the 'senior researcher' Ben Chertoff on his show tonight (3/5/2005)..
Christopher Bollyn from American Free Press apparently has been hawking on Chertoff, 'head researcher' of the Popular Mechanics article 'debunking' the major myths of 9/11..
WILL ART BELL ASK BEN CHERTOFF ABOUT HIS TIES TO DHS? 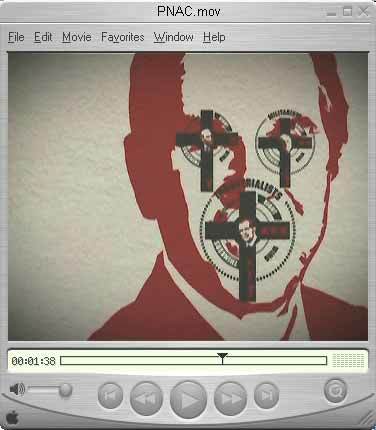 wow.. i got a link last night to this video, and it is really really impressive.. the graphics in it are free-flowing vector graphis, and its focus is on the war on terrorism, PNAC, and the motives for wanting war..